A common species of the western United States and Canada. Males are notable for their dark markings, with reduced white scales on the carapace. The rami of the embolus are more widely separated than in clemata, balia or chalceola. Males from the eastern part of the range (e.g., South Dakota, Utah, Arizona) have a broader embolus with more noticeable rami than those from the pacific coast. Females can be identified by carapace and abdominal markings, the epigynal topography and angled flaps. The epigynal surface rises more abruptly behind the flaps than in balia, but not so raised in a bulge as in insignis or clemata. The epigynal flaps are much more robust than in the sympatric Metaphidippus mannii, from which aeneola also differs in markings, including having white scales between AME. In Washington, collected from pines including Pinus ponderosa, understory of riparian poplar woodland, understory ferns, Ceanothus, alders in bog, lakeside marsh, houses; at elevations of less than 50 m to more than 1700 m. More than 15 adult males and females were recovered by D. H. Mann and others on snow at 1700-3000 m, apparently having ballooned (Pierce Co., Washington). In Oregon, commonly collected from Abies grandis and Pinus ponderosa; also from Pseudotsuga, Picea, Pinus contorta, hemlock, alder, Salix, bracken fern, Calocedrus, Taxus, oak, Ceanothus, and Larix occidentalis. Curtis (1892) reports it common in San Francisco area gardens on honeysuckle, rose bushes, live oaks, and Laurestina. In Nevada beating pinyon pine; in Arizona on pine. 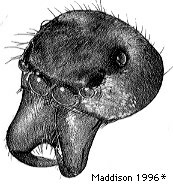 Life cycle: In Oregon`s Malheur National Forest, B. Fichter and A. Moldenke collected 44 M 77 F from 12-17 June 1982, 6 M 25 F from 18-23 July 1982, and 81 F from 20-29 September 1982. In the San Francisco area "males and females appear as adults as early as April, but the former become rare after the first of June and the latter after the first of September. The females begin laying eggs in May" (Curtis, 1892). Curtis reports one or two egg sacs per female with about fifty eggs that hatch on average in 25 days. In Los Angeles County, California, the 20 FF examined by me were collected from November through June; the 21 FF from February though June plus two in September. Behavior: Curtis (1892) describes the spider`s entrance to and defense of its retreat, its ballooning, and its reaction to a sluggish pet lizard. Land (1969a, 1969b, 1971) investigated visual behavior and eye structure and function of P. aeneola. Western United States, extending into Canada and Mexico.